In creating a photo or video video or montage of the deceased's life, you need a variety of pictures; typically about 35 photos. The photos should cover in chronological order the span of the deceased's life, from infancy to the present. Close up shots are best. Select a song or music that had meaning to the deceased. Ideally the photo presentation should be approximately one song length: three to five minutes. Longer than that and you will find people's attention starts to wander. 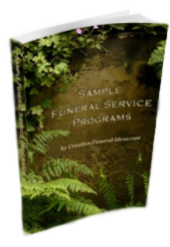 If you don't want to do it yourself, you can provide the funeral director with your photos and song choice and they will create the video tribute for you. Costs vary. 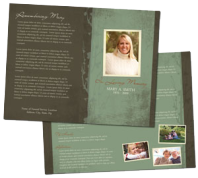 Funeral homes charge typically $350 to $500 to create the slide show for you. They will also look after the technical side of things as well, if you are holding the service at the funeral home. Or you might want to check out Animoto.com, where you can make stunning video slideshows in no time at all. Your photos, videos and music are melded together in a way that feels somewhat like a MTV video. Before you read any further, I want to give you a heads up that there are affiliate links to Animoto on this page. This means if you purchase something through one of my links, it won’t cost you anything extra. However, I may receive compensation for your purchase, this is known as affiliate marketing. Read my full disclosure here. This is one of the ways that I earn money through my site, to cover it's costs. This is a video I made for my husband for Valentine's Day. It only took me a few minutes. 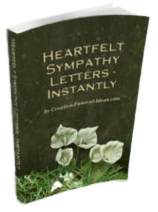 Create An Extraordinary Funeral Tribute Video in just minutes at Animoto. When my brother passed away, after a two year struggle with cancer. Putting together a photo presentation was a very healing time for all of us - remembering the good times, after what we had just been through the last few weeks in the hospital. His children, wife, and I went through all of their photo albums selecting pictures for the video tribute for his memorial service. (Be sure to number each picture and put a corresponding number in the spot in the album you removed it from. Otherwise you'll never remember where each photo belongs.) We scanned them and then went through all the digital photos. We also selected a couple of short videos to add to his funeral video tribute. Click below for four examples of tribute videos. Then we went to Animoto.com - and selected a storyboard template. You can either upload your pictures manually or send Animoto to fetch them from other sites like your Facebook account, Instagram, or Flickr. Adding music works the same way: upload your own mp3 or select a track from their growing library of music beds. Once it has your pictures and music, it analyzes both and puts them together in a great video. And, for an extra measure of fun, send the pics and music through again and again to get other remixes of your slideshow. No two videos are ever the same. We added a number of headings to describe the event of several of the photos. They also have several distribution options. Once the video is complete and you're satisfied with the output, you can easily download it, make a DVD, send it to YouTube, and more. Thirty-second clips are free, but you will want to opt for the unlimited videos and downloads, to eliminate watermarks. That costs $26 month to month or $96 a year. There is also the professional version at $312.00, annually, which allows you to add more than one song. As you can see, it's pretty slick and requires exactly zero technical expertise. Best of all, it took absolutely no time to complete. Animoto gives you the option of trying it out for free, with watermarks, to let you see what you can create. To have a look at four examples of tributes and what you can create, go to this page and scroll down. If you want to edit your video, it renders a whole new version of it, which means it won't necessarily look like the one you created previously. At the same time, every edited file is saved as a completely new version of your video, so you never lose anything. Easy one-click professional quality video creation. One-click video sharing with social media sites like Facebook, Twitter, etc. One-click posting to YouTube and SmugMug. Includes a large selection of royalty-free pictures and many genres of music (also free to use), so you don't need to source everything of your own if you prefer. Pro version offers the ability to create High Definition versions of your video. Compared to professional video-creating software, Animoto offers reduced capabilities and flexibility. Every remix is different. There is no way to control the transitions between frames or the appearance of your video - it creates a new and unique version of your video each time you make revisions. Sometimes, you end up with something cooler, sometimes you don't. It's best, therefore, to do your best to "try to get it right the first time." There is a 14 day free trial. Or take the $26 month to month option or pay $96 for an entire year. The following is a comment from a site visitor. "It's simple to use and efficient ...not a lot of custom features available however the ease of use more than makes up for this shortcoming. I have used IMovie and several others but they are far too time consuming in my opinion. My time is too valuable to be messing around with techie stuff for hours." With Animoto, you get the best of both worlds – ease and beauty. It only takes minutes to make a video, but you'll get so many compliments because it looks like you spent hours making it. Her father has written this song in Vicki's memory and created this beautiful video tribute. He sent it to me with the hope that others will find comfort with his words and music. The song’s video includes videos and photos of Vicky.